Next Sunday, September 13th is Grandparents’ Day and I’m SO excited!! We have a lot of family and we rarely get to see all of them at one time and in one place. I think the last time we were able to pull that off was for Camden’s 2nd birthday, almost 6 whole months ago. That’s our picture from last year when we announced that we were having a baby! 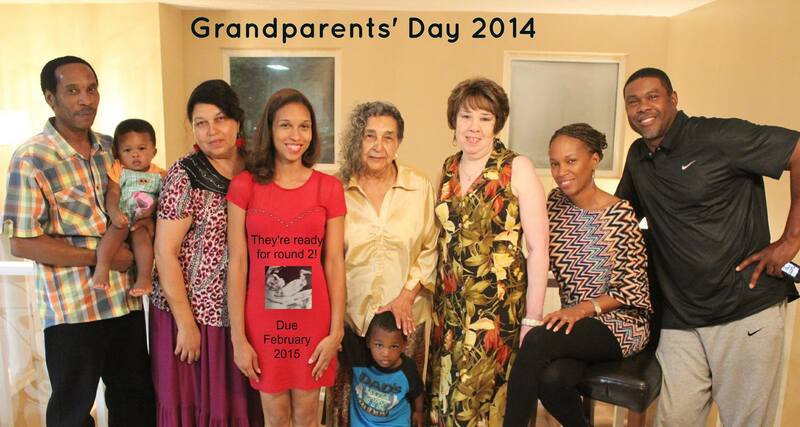 Well the grandparents already knew but they helped us announce it to the world! Imagine having to keep a secret from all of them for 5 months Yeah it wasn’t happening lol. Unfortunately, we were missing 1 grandma and 1 great-grandma who lives out of the state. And the extra little person is my cousin. I love him to pieces but I shall not claim him as my own lol. Similar to last year, we’re not planning a big shindig. Just something very simple and meaningful! This year should be interesting enough with the addition of our 7 month old daughter. It’ll be fun just watching them pass her around while going back and forth about who she resembles the most, lmbo. Did I mention that our children are the “1st” grandchildren for our parents?! AND everyone has been hoping for a little girl for quite some time. My husband has 5 brothers and none of our siblings have children. I’m not sure if our kids fully understand how good they have it lol. Seriously though, we’re so thankful to God for each of them being in our lives. Words truly can’t express our gratitude! Grandparents’ Day or not, they definitely ROCK! Holidays are such fun times for me because I get to put my artsy hat on and attempt to create masterpieces with all of the stuff that I have laying around the house. Let’s not talk about all of my failed art projects smh ( <- for my grandparents reading this, smh = shaking my head) :-). Join me and celebrate the special people in your lives…. Check out my latest Pinterest board for a little inspiration and quick gift ideas. I’d tell you which gifts I’m working on but our parents and grandparents are pretty savvy internet searchers and are probably reading along right now! Overall just remember to keep it simple! Can’t afford any gifts? Just invite them over to spend some quality time or better yet make a pop up visit at their house! With us children being so busy these days, time is as good as any material gift. And if you live with the grandparents, just give them a break for a little while. They may actually enjoy time away from you LOL!